I also told him that “Gwen” has considerable patience and good call control and could have a future in legitimate technical support. He asked me if I had anything else I wanted to talk about before wishing me a good day and hanging up. I know otherwise intelligent people who have lost time, sleep, and too much money to scammers who lock users out and charge ~$200 to let you back in (to your own computer!). Bottom line: No one, especially Microsoft, will ever call you out of the blue to tell you there’s a problem with your computer. Or more accurately, stolen and recovered. I’m a member of 24 Hour Fitness. Last night at the gym, I put my backpack in a locker and put my lock on the outside as normal. I thought I closed the lock, but it may have gotten stuck just before latching, a problem I’ve immediately rectified in the past. It just takes once to learn a lesson though, and boy, was I in for it. After my workout, the locker where I’d left my stuff was empty, save for my towel (which told me I had the right one, at least). A wave of incredulity washed over me as I thought not about the normal stuff that’s always in a gym bag, but the valuables in my backpack: my electric wet/dry razor; a comb that had been a gift from a close friend in Japan; my wallet with about $50 in cash, driver’s license, and bank card; my cell phone; and my passport, recently used on a short trip into Canada. Oh, and the car keys without which I was neither going to drive home nor have easy access to my bed. Slightly lightheaded by now, I checked the lockers around where I’d left it- nothing. I jogged out to the front desk and begged the girl working there to tell me someone had turned it in, but of course no one had. Returning to the locker room, I glanced in the trash cans, thinking a thief might have taken the valuables and dumped the rest, but no luck. Slightly panicked now, I started opening all the unlocked lockers. At the far end of the locker room, about a hundred lockers away from where I’d left it, I found my backpack. A hurried search revealed my passport, keys, and driver’s license, but conspicuously absent were my cell phone, debit card, and cash (I assume the thief threw away the lock). At least I could drive home. So I did, after using the gym’s phone to report my debit card stolen. At home, I sat down at my computer to see if I could track my cell phone, but it looked like it had been turned off as it was removed from my locker, because the last point before it went dark in Google Maps’ Location History was at 24 Hour Fitness. I also looked up my phone’s location using Android Device Manager, but it couldn’t establish a connection to the (currently offline) phone. 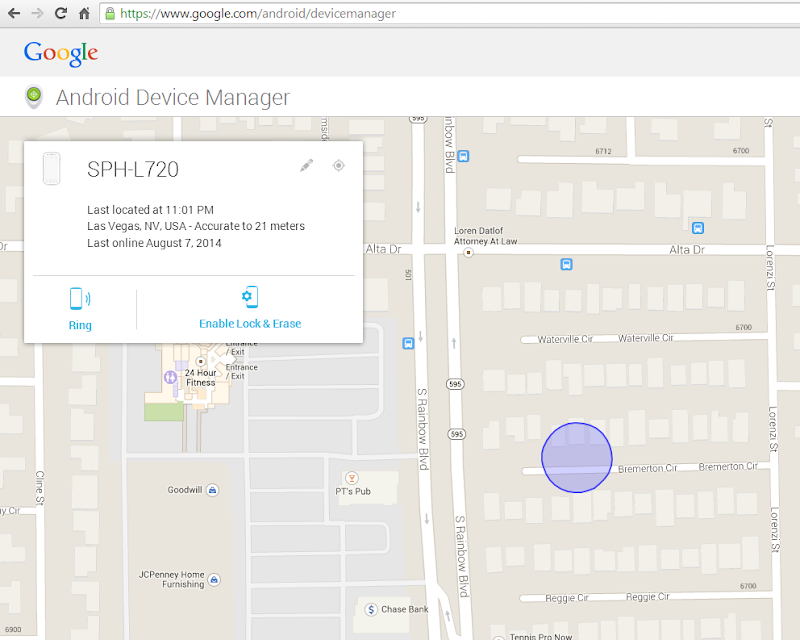 So there I sat, thinking about having to get a new phone, while occasionally refreshing the Android Device Manager page just in case the thief might turn it back on. To my great astonishment, it showed back up after about two hours. It was on just long enough to get a GPS fix, then turned back off. The phone was practically across the street from the gym, in a housing tract just on the other side of a cinderblock wall. So I called the police. The friendly officer on the non-emergency 311 line informed me that GPS fixes can be off by anywhere from 50 to 150 meters, and the police will not respond to a location just from that. I told the nice lady that the GPS fix was confident to a 20 meter radius, which only covered three houses, but she was firm. In fact, she specifically advised against going to look for it. Now I faced a dilemma- my phone had been stolen, I knew exactly where it was, and the police were not going to help get it back. I knew time was of the essence if I had any hope of getting it back intact, so I went. Of the three houses, two were dark, with no signs of life. The third had a cluttered front yard with two cars… and a man sitting in a lawn chair in front of the garage smoking a cigarette. Without hesitation, the man stands up and hollers inside for his son, asking him what he’d done this time. At this point I figured I’d come to the right house. At this point I knew I was in the right place, and things start happening fast. Dad calls his son on the phone when he realizes he’s not actually among the assembled, and it turns out he was already on the way home. Son arrives in the back seat of a female friend’s Lexus and denies knowledge of any theft, but won’t get out of the car, forcing his dad to walk out in the street and talk through a half-closed window. Dad spends a few minutes arguing with his son, and one of the ladies in the front gets out, slams her door and runs inside. When she comes back out, can you guess what she had in her hand? Yep, my cell phone, along with my debit card. The phone was still in the process of booting to the recovery console when she handed it over, an act to which one of the original deniers quickly copped. He sounded irritatingly proud of himself as he described how easy it was, in fact. After they ran off, I told dad the boys were on a wild goose chase, and he told the two boys remaining that they were now going to have to pay for my new SIM card in addition to replacing the $50 from my wallet. David, the original denier who knew the button combination to start the recovery console on my phone, said he had $20, but since SIM cards were only $15, did I have any change? For a teenager just caught participating in the theft of a $500 phone (a felony in Nevada), this kid had some big brass balls. I told him he could get the change from one of the other kids who took my cash, then realized he was probably paying me off with my own $20 bill anyway. The son calls at this point, and says they’d located the pieces of the SIM card, right where they’d left them seen “some Mexican kid” drop them. At this point, I was done. It was obvious to me that dad was incapable of offering meaningful consequences to the boys, who all still denied any involvement in the actual theft. I had my phone, my now-cancelled ATM card, $20 of the $50 taken from me, and a very well-learned lesson. So I left, thinking about how well it had gone compared with how poorly it could’ve, and counted my lucky stars. I’ve now ordered a new SIM card from Credo, my cell phone provider, and a new bank card from Citibank. I doubt I’ll pursue any legal action, just as I doubt the boys learned anything from their experience. It’s certainly not my place to teach them how to live their lives, but it’s obvious they have some maturing to do. I just hope they don’t do something that lands them in jail before they do it. Unicycling is not an uncommon activity for elementary school children in Japan. Here’s what it looks like when they refuse to collect your garbage. It’s often because something is wrong with the way you’ve prepared your recycling, or you’ve put the wrong kind out for that day’s collection (as I believe this person has done); you get a nice little sticker explaining why they didn’t collect it. 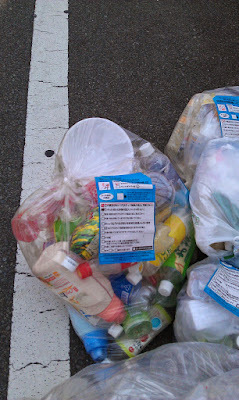 This picture was taken before Matsuyama got stricter about plastic collection. You used to be able to put bags of mixed plastic like this out for collection, but now you have to take the labels and caps off PET bottles, and put just the bottles out on another day. I mentioned on Facebook last month that it felt odd to not have a passport in my possession because I’d mailed it into the Osaka Consulate for renewal. Well, I’m happy to say I received my new passport book. It’s a bit different than the old one. First of all, they gave me the 52-page passport even though I only asked for the standard 28 pages. I’m guessing that’s because people renewing from outside the country are assumed to have a higher likelihood of filling it up. Also, I wasn’t sure how they’d handle my valid visa- whether they’d just invalidate it or issue me a new one or what. They ended up just sending both passports back to me, with holes punched in the old one except for the page with my visa, complete with complimentary retro-style hanging chads! You can see the holes they punched in my old passport, as well as the new picture they stapled to it. The old one was issued by the Los Angeles Passport Agency, but (presumably because it was issued outside the US) the new one is issued by the United States Department of State, which bestows a benefit of cool +1. The new passport has an RFID chip in it to enable another layer of authentication. If you look closely, you can see the icon on the front cover. Also, the front and back covers are much stiffer than before- they feel like they have stiff plastic embedded in them, which I guess is to protect the chip from bending and breaking. Aside from the outer cover, the photo and info page has moved from the inside front cover to page three. The renewal process wasn’t too bad, but had some unusual requirements. You send in a PDF generated by their site after filling out a questionnaire on the State Department web site. The form is, of course, letter-size, but the closest paper size in Japan is A4, so I had to shrink it to print. You also need a money order for $110 denominated in USD- which, surprisingly to me, is available at the post office for the (not very) low cost of $20. They can issue postal money orders denominated in a number of foreign currencies, but the form is very tricky, and they don’t allow mistakes. For instance, there are two fields for address, one associated with your ID, and one with your residence. In my case, my ID shows my old address, so I wrote that in the field for ID, but my actual address in the address section. They made me fill out the form again with matching addresses. >:( Also, the photo size (2″x2″) required isn’t standard here, so I had to print a larger size and trim it down. Sending it in just required a pair of prepaid postal envelopes, which are easy enough to get. Then it’s just a waiting game. Mine took about two weeks, just like the woman on the phone said it would before I mailed it all in. It’s not unusual for me to go a day or two without using “regular” utensils. 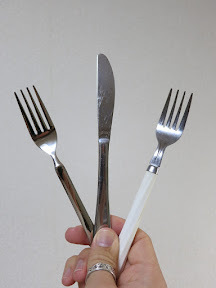 -and it reminded me that until last weekend we had exactly one fork and exactly one (table) knife. In our “silverware drawer,” there’s a section for cooking utensils (including two pairs of 30cm chopsticks and standard slotted spoons and whatnot), a section for chopsticks (filled to overflowing, in fact… just counted, eight pairs), and a section for miscellaneous utensils (including a couple muddlers, four full size spoons, a few dessert spoons and dessert forks, and the utensils you see pictured here). Yesterday morning, my dog of 14 years finally succumbed to the lymphoma she’d been fighting for almost a year. As Amanda said, it’s hard to believe we all watched her grow from a tiny little puppy to become an elegant old lady and pass away. She came to Reno with me when I went to UNR and back to Vegas with me when I returned to UNLV. In 2000, she had a litter of eight puppies and was probably at least a grandmother by now. Her last few years were spent with my mother while I’ve been here in Japan. Ellie enjoyed how busy my mom’s house is and all the people she got to meet while my mother taught music lessons. She entertained younger siblings and parents alike, and she helped my mom’s house feel a little less empty after my brother and I both moved out of the country. It’s “unlisted” on YouTube out of a vague sense of… not privacy concerns per se, but because I’d rather not have directions to my apartment searchable on YouTube, really. I mentioned Sala Sol once before, but here’s an actual video I took inside the place a few weeks ago. Between the reality of its small size and the lack of real options in this relatively small city, it’s regularly full to capacity. Sometimes I’m amazed the wait staff can still wade through the crowd. 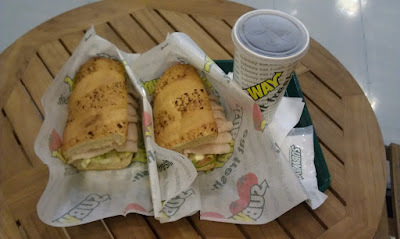 Here’s my Thanksgiving day turkey dinner. You probably won’t be surprised to hear that turkey is an uncommon meat here in Japan, let alone whole turkeys. Whole birds are available from a select few mail-order importers, but they run close to $50 each. And that’s assuming you have someplace to cook the thing, as “full size” ovens are also rare. With the double meat I got, this is easily the most turkey I could get in a reasonable meal.